I haven't played this yet, but there is zero chance I won't buy it after seeing it. Update: Just played it. 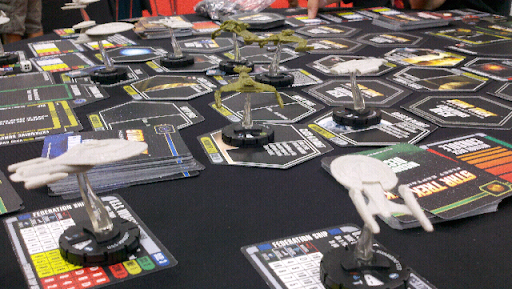 Destroyed my opponent's Sutherland after also dumping tribbles onto his Defiant. Game is almost too random for me, but I like it anyway. 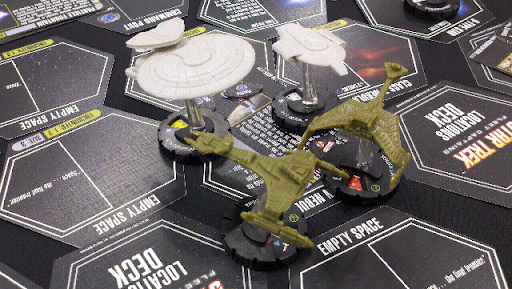 My two Klingon warbrids (one heavily damaged) are about to destroy the Sutherland (already slightly damaged) as the Defiant watches helplessly, having been overrun with Tribbles I beamed over through their shields. Long live the Klingon Empire! I see a die in the background. All of your previous ranting about the unimportance of theme has been invalidated! Bah! As for that die, I did say the was almost too random for me. I stand by the claim that theme is irrelevant, despite the undeniable, insurmountable, irrepressible awesomeness of disabling the Defiant with a basket of tribbles and then blowing the Sutherland out of the stars!